With Toyota and others offering fuel cell powered vehicles in 2015, it's time to tackle some myths about fuel cells and the vehicles that will use them. 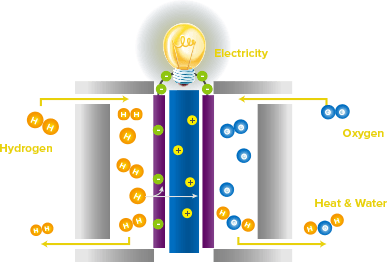 Fuel cells don't burn hydrogen - they use an electrochemical process to convert hydrogen and atmospheric oxygen into electricity and water. They have no moving parts and no open flames. This used to be true - a prototype 2007 Toyota FCV reportedly cost more than $1 million dollars to build. However, recent advances in fuel cell manufacturing and catalyst performance have led to a dramatic cost decrease. According to the US Dept. of Energy, fuel cells will cost $30-$50 per kw of output by 2020, depending on production volume. To put this number in perspective, Tesla battery packs are estimated to cost over $250 per kw-hr of capacity today and may fall to $196/kWh by 2018. Some optimists belive battery pack costs could fall to $100/kWh by 2025, while others believe battery pack costs will fall no lower than $167/kWh by 2025. The point? 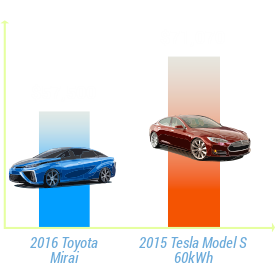 A mid-sized car with a 60kWh battery pack will likely cost more than a similar sized car with a 125kW fuel cell, all things being equal. Fuel cell cars might not be "cheap," per se, but they likely won't be any more expensive than battery powered vehicles (and could be a great deal less). A gallon of gasoline currently costs about $2.50 as of December, 2014, and that gallon will take a new Prius about 50 miles, resulting in a fuel cost of $0.05 per mile. A kilogram of hydrogen will cost $3.50-$6, according to research from the National Renewable Energy Laboratory (NREL). 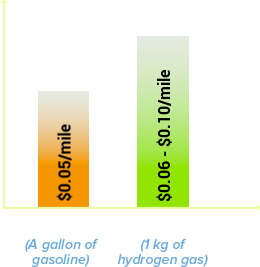 With a range of approximately 60 miles per kilo of hydrogen, the fuel cost of a first generation fuel cell powered vehicle will be $0.06 - $0.10 per mile. Considering gasoline prices are as low as they've been in years, and considering that future versions of fuel cell powered vehicles (and refueling infrastructure) will likely be less costly, the notion that hydrogen is "too expensive" compared to gasoline is poorly reckoned (at best). This argument assumes the very best about future gasoline pricing and the very worst about future hydrogen pricing. Odds are, fuel cells vehicles will be no more expensive to operate than gas-powered vehicles and perhaps quite a bit less. FCVs are too dangerous for everyday use. However, vehicles with high pressure gas storage tanks are nothing new. Most vehicles that run on compressed natural gas (CNG) have them. What's more, Toyota's new FCV will feature a carbon fiber hydrogen storage tank that can withstand a shot from a .50 caliber military sniper rifle. 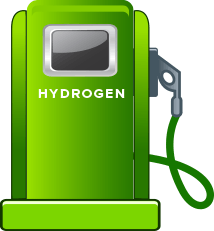 None of the upcoming fuel cell vehicles (or existing hydrogen fueling stations) use liquified hydrogen. 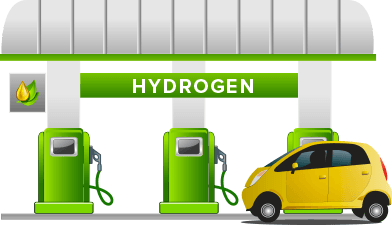 If fuel cell vehicles used liquid hydrogen, it would be very wasteful, as cooling hydrogen down to liquid form would require a great deal of energy... but that doesn't apply here. 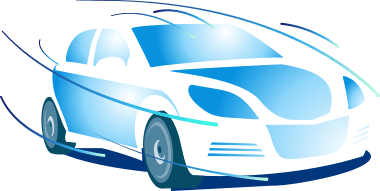 hydrogen-powered vehicles is essentially the same as technology that's used to refill vehicles that run on compressed natural gas (CNG). Currently, there are more than 16 million vehicles worldwide powered by CNG using pressurized systems without incident. According to various announcements from Linde North America and First Element Fuels, hyrdogen refueling stations cost about $2 million to construct, which is the average cost of a gasoline refueling station according to this analysis from the National Renewable Energy Laboratory. Not only are hydrogen filling stations cost-comparable to gasoline filling stations, but First Element Fuel (a brand new company that has begun constructing hydrogen stations in California) says their stations will be profitable in five years, despite the fact that there are very few hydrogen cars currently on the road. 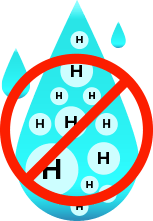 Steam reformation is the most common method used to produce hydrogen today, but it isn't the only viable method of hydrogen production. 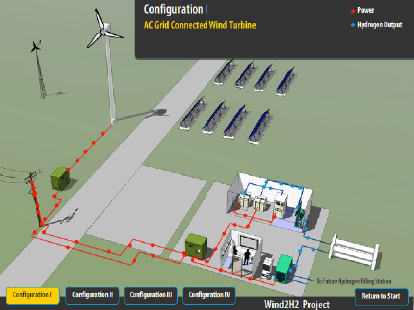 The National Renewable Energy Laboratory has a functioning wind-powered hydrogen filling station in Boulder, Colorado that uses wind power to create hydrogen via electrolysis. German energy giant Linde will begin producing hydrogen at commercial scale via wind power by 2015. There are also solar panels in the research and testing phase that can break water down into hydrogen and oxygen via photoelectricsynthesis and do so at extraordinary efficiency levels. While existing renewable alternatives to steam reformed hydrogen are more costly, and new methods of creating hydrogen from solar power require more research to become commercially viable, it's not reasonable to say that hydrogen can only come from natural gas. Battery electric vehicles have a low operating cost, excellent performance, and they plugin to an existing (and generally efficient) energy grid. These are big positives. However, BEVs can't be refueled in 3 minutes, and (as of now) can't go 300+ miles between refueling. Batteries are also problematic for use in pickup trucks and SUVs, as towing and/or hauling would dramatically compromise driving range. Fuel cell vehicles, on the other hand, have long range, fast refueling, and could easily be used in trucks or SUVs without sacrificing payload or tow capacity. 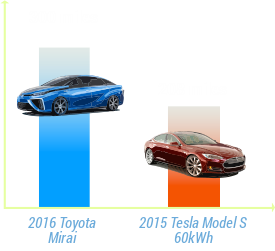 While battery electric vehicles have a lot of positives, it's a mistake to assume that they're obviously better than fuel cell vehicles. 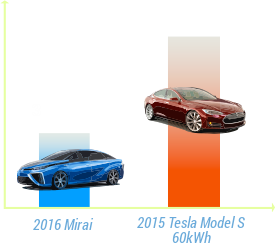 It's simply too early to declare a "winner" in the battery vs fuel cell debate. Elon Musk, with much of his personal wealth invested in battery-electric car technology, says rival fuel cell vehicle technology is "BS." Tesla's Elon Musk once famously quipped that fuel cells are "so BS." Considering Musk's reputation as an innovator and his success with Tesla, many people have taken this comment at face value. 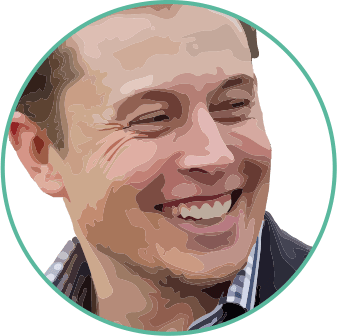 However, in light of FCV range and refueling ease, and Musk's personal investment in battery electric vehicle technology, it would be a mistake to accept his criticism of fuel cells without skepticism. NOTE: A great deal of misinformation about hydrogen fuel cell vehicles stems from an article in The New Atlantis magazine. Please note that this article is several years old (it was written in 2007). Much of what was written is no longer accurate. This page was created by Spork Marketing and references both cited data sources and official Toyota news releases. Visit http://www.toyota.com/fuelcell/ for more information about Toyota's new FCV.